The NLCS certainly got started with a bang on Friday night. The Milwaukee Brewers seemingly did the impossible in knocking out Los Angeles Dodgers ace Clayton Kershaw out of the game after only 3-plus innings. Milwaukee was able to build a 6-1 lead, only to barely hold on at the end for the 6-5 win. Nevertheless, the Brewers won their 12th consecutive game and took a 1-0 series lead heading into Game 2 on Saturday. If the Dodgers want to look for someone to blame for their Game 1 loss, they can look no further than the mirror. The Dodgers committed four errors in Game 1, including a pair by catcher Yasmani Grandal. In the end, only one of Milwaukee’s runs was unearned, but those four errors certainly made Kershaw work a lot harder and played a role in his early exit. That one unearned run also ended up being the difference in Milwaukee’s 6-5 win. Needless to say, the Dodgers will have to clean things up in Game 2. Down in the series, the Dodgers will look toward Hyun-Jin Ryu in Game 2. Ryu returned from a groin injury in mid-August and has been arguably the best pitcher in baseball since then. In nine starts after returning from the injury, he was 4-3 with a 1.88 ERA. He also fired off seven scoreless innings against the Braves during the NLDS. He now has a 1.96 ERA in his four postseason starts. On Saturday, he’ll face a Brewers team that has only three players who have ever faced him before. Meanwhile, Milwaukee will send Wade Miley to the mound for Game 2. Miley also missed a significant chunk of the season with an injury but was outstanding when he was healthy. In 16 starts, Miley was 5-2 with a 2.57 ERA. The caveat is that he rarely goes deep in games, not that Craig Counsell is counting on his starters to do that anyway. Against the Rockies during the NLDS, Miley was pulled after 4.2 scoreless innings, giving up just three hits and a walk. For the Brewers, the biggest X-factor in Game 2 could bullpen fatigue. Milwaukee got six outs from starter Gio Gonzalez on Friday, forcing the bullpen to give them the final 21 outs. That may have been the game plan, but it’ll be tough to pull that off two days in a row against the Los Angeles lineup. 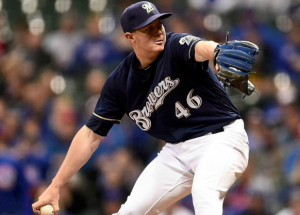 Also, Brandon Woodruff and Josh Hader may not be available after both went multiple innings on Friday. Counsell will have to go deeper into his bullpen than he wants if Miley can’t give them at least five innings. Remember, the Brewers only used five different relievers during the NLDS, but they already used six in Game 1. In short, Milwaukee’s bullpen may not dominate this series the way they did the NLDS. For the Dodgers, the X-factor in Game 2 could be David Freese. He started Game 1 batting third but was pulled for Max Muncy after Gonzalez left the game for Woodruff. However, he could get another start in Game 2 with Miley on the mound. Freese is 7 for 18 (.389) with a home run and four walks in his career against Miley, so he is someone who can do damage against the Milwaukee starter. However, it remains to be seen if Dave Roberts will be more willing to stick with him after the Brewers go to their bullpen, especially with Hader unlikely to pitch after going three innings on Friday. The Los Angeles bullpen may be just as tired as the Milwaukee bullpen after Game 1. The only difference is that Ryu is likely to go deep in this game whereas Miley probably won’t. With the Brewers having so little experience facing Ryu, look for him to deliver a gem. As the Dodgers showed last night by nearly erasing a 6-1 deficit, they can get to Milwaukee’s bullpen eventually. Behind Ryu and a few timely hits, look for the Dodgers to even up the series. Los Angeles wins 5-1.